Also, please note that Nicholas and others are heading up to the Pine Ridge Reservation on Saturday to help with the severe flooding that has affected that area. If you can bring donations or cash (see end of salon announcement for needed items), that would be much appreciated. The 21st century is shaping up to be one of the most threatening for the human race. The 6th great extinction is underway and the diversity that once defined this planet, the human species, and our agricultural lands is disappearing faster than you can say “Anthropocene Extinction”. Surprisingly hardest hit is our agricultural diversity. More than 90% of the species, cultivars, and variants that co-evolved with humans are now extinct. Closely behind are cultural diversity, languages, and global biodiversity. The incredible diversity of agricultural plants and animals was mostly due to thriving and interconnected small-scale agricultural communities. Particularly, the practice of breeding genetics that thrive in your area and sharing these genetics with your neighbors and other communities, through the processes of sharing animals for the sake of mating, or seed saving and swapping. This tradition is almost extinct, and the erasure of much genetic history has ensued. Coupling this with the globalizing trend of capitalism and the commodification of Nature, we are facing quite the fiasco. There are many problems with this trend, but one is that losing diversity means losing resiliency. Another problem with this trend is that the average American doesn’t know where plants actually come from (Spoiler Alert: Seeds). At the salon on March 22nd, Nicholas Mouton will deliver a short, visually stimulating presentation followed by a discussion about seeds and why learning how to plant and save your own (and learning how to share with your neighbors) may be one of the most important skills for us to relearn in the 21st century. Salon duc Tape, a public forum sponsored by the Fort Collins Community Action Network (FCCAN) meets on the 2nd and 4th Fridays of each month from 7:00 — 9:00 p.m. at the FoCo Café, which is located at 225 Maple Street. Light refreshments will be available. The formal program will begin at 7:10. For more information, email us at info@fccan.org, or call us at 419-8944. 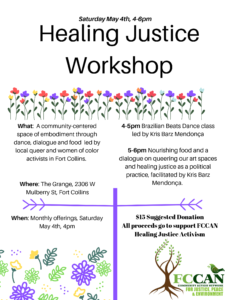 After presenting the salon, Nicholas will be heading up to Pine Ridge with other folks from The Fort Collins Mutual Aid Group. Flooding at Pine Ridge is severe and 50 families (500 people) are currently displaced and are being sheltered in a local tornado shelter. If you are able, please bring any of the following to the salon: bottled water, beans, onions, canned food, ramen, potatoes, hygiene products (diapers, feminine hygiene products, soap, toilet paper, shampoo, tooth paste, deodorant), cots, sleeping bags, blankets, air mattresses, shovels, gloves, bags to fill with sand, and clothing. Cash donations to help purchase propane, gas, any other needed supplies is welcome, or go to https://fundrazr.com/91Rkbc?ref=sh_f7oik4 to make a donation.